Very good condition! Dust jacket intact. ISBN : 0743250346. The Frumious Bandersnatch (Mcbain, ed). Title : The Frumious Bandersnatch (Mcbain, ed). Authors : McBain, Ed. Binding : Hardcover. Product Category : Books. Condition : Good. List Price (MSRP) : 25.00. Condition: Very Good. - Back Cover: Excellent. - Interior of Pages: Clean. "Alice In Jeopardy" by Ed McBain. 2005 Simon and Schuster 1st edition 1st printing. Signed by author on title page. 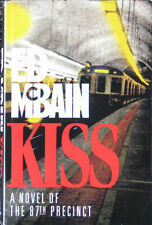 A Novel of The 87th Precinct:Kiss by Ed McBain. An almost impossible to put down page-turner! Author : Ed McBain. Title : Where There's Smoke. We use the traditional book grading system of (from best to worst): As New, Fine, Very Good, Good, Fair, Poor. Edition : First. The Small Print. If anything, we tend to grade lower than we should. Author: McBain, Ed Publisher: Simon & Schuster. Binding: Hardcover Publish date: 2002. Condition: New! A beautiful 1st Edition copy of Ed McBain's short novel DRIVING LESSONS. Book dealer second. I'm always out bookscouting and adding to inventory. BOOKS ALWAYS BOXED AND I ALWAYS BUBBLE WRAP. Author: McBain, Ed Publisher: The Viking Press. (Item #Z0670200301Z3|0). Other notes. 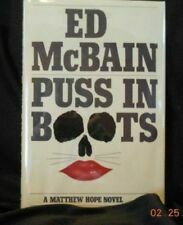 Author: McBain, Ed Publisher: Gallery Books. Condition: New! Binding: Hardcover Publish date: 1999. By Ed McBain. My goal is to make this a pleasant and worthwhile buying experience for you. 1st edition. The Big Bad City by Ed McBain (Like New, Read Once, Dust Jacket). Condition is Like New. Shipped with USPS Media Mail. A BEAUTIFUL First Edition copy of this early Ed McBain mystery. Book dealer second. I'm always out bookscouting and adding to inventory. BOOKS ALWAYS BOXED AND I ALWAYS BUBBLE WRAP. 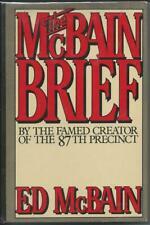 The McBain Brief by Ed McBain. Arbor House (1982). Book Club Edition. Good condition hardcover with jacket. Book has light wear. Romance : A Novel Of The 87th Precinct by Ed McBain (1995 Hardcover) SHIPS NOW! Ed McBain's Mystery Thriller "Vespers - the 87th Precinct" was published as hardcover with dust jacket by Morrow c1990 (0-87795-987-0). Book is a stated 1st edition, 1st printing in Like New condition: no obvious faults or issues. While "And All Through the House" contains typical Ed McBain dialogue and plot absurdities, it is actually an illustrated short story in a self-contained book. I think other readers may have expected a full-length novel with several different story lines, but this story is strictly about a few hours in the detective's squad room on Christmas Eve. A beautiful First Edition copy of Ed McBain's CINDERELLA. Book dealer second. I'm always out bookscouting and adding to inventory. BOOKS ALWAYS BOXED AND I ALWAYS BUBBLE WRAP. A beautiful 1st Edition copy of Ed McBain's - TRICKS. Book dealer second. I'm always out bookscouting and adding to inventory. BOOKS ALWAYS BOXED AND I ALWAYS BUBBLE WRAP. A Nice First Edition copy of Ed McBain's Bread. Dust Jacket is VERY GOOD (nicks to corners; small crease to front flap corner). BOOKS ALWAYS BOXED AND I ALWAYS BUBBLE WRAP. Book dealer second. I'm always out bookscouting and adding to inventory. 1st edition 1st print of ‘Til Death by Ed McBain!! Early 87th Precinct Novel!! Here is a wonderful copy of ‘Til Death by mystery master Ed McBain. This is a first printing as stated on the copyright page. The book binding is square and tight. The pages have begun to darken throughout as this was published in 1959. The jacket has been price clipped as shown and shows some wear mostly in the form as small chipping around the edges. This title will make a wonderful addition to any collection or library and as always I never list ex library or book club editions so buy with confidence. And please check out my 100% positive seller feedback! Thanks for looking. Publisher: Orion ISBN 13: 9780752872360. Title: Transgressions Item Condition: used item in a very good condition. Author: edited by Ed McBain ISBN 10: 0752872362. Author: Ed McBain ISBN 10: 0752855867. Title: Hark! Item Condition: used item in a very good condition. Four mysteries by Ed McBain: "Cinderella" was published as hardcover with dust jacket by Henry Holt c1986 (0-03-004959-8). Book is a stated 1st Edition, 1st Print in Like New condition: very light chipping at jacket edges, no other obvious faults or issues. Author: Ed. McBain ISBN 10: 0340728051. Title: THE LAST DANCE: A Novel of the 87th Precinct. Item Condition: used item in a very good condition. Binding: Hardcover Language: english. Edition: First Edition List Price: -. Title: Fiddlers Item Condition: used item in a very good condition. Author: Ed McBain ISBN 10: 075286954X. Things (anything not a book) will not combine automatically. Author : Ed McBain. Title : Eight Black Horses. We use the traditional book grading system of (from best to worst): As New, Fine, Very Good, Good, Fair, Poor. If anything, we tend to grade lower than we should. Money, Money, Money by Ed McBain 2001 Hardcover. LIKE NEW! 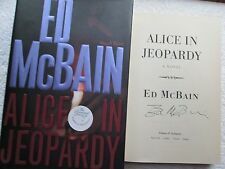 Money, Money, Money by Ed McBain 2001 Hardcover. Children section. New and Used. Comic Books. 143 North Main Ave. Large Print. 5 out of 5 stars - Money, Money, Money by Ed McBain 2001 Hardcover. LIKE NEW! 1 product rating1 product ratings - Money, Money, Money by Ed McBain 2001 Hardcover. LIKE NEW! Author: McBain, Ed Publisher: William Morrow & Co. Binding: Hardcover Publish date: 1992. Condition: New! Other notes. Candyland by Evan Hunter & Ed McBain. A Novel in Two Parts. Hardcover with dustjacket. Author: Ed McBain ISBN 10: 0340589493. Title: Mischief Item Condition: used item in a very good condition. A beautiful First Edition copy of Ed McBain's BEAUTY AND THE BEAST. Book dealer second. I'm always out bookscouting and adding to inventory. Holt, Rinehart and Winston 1982. BOOKS ALWAYS BOXED AND I ALWAYS BUBBLE WRAP. Author: Ed McBain ISBN 10: 0241124433. Books will be free of page markings. Will be clean, not soiled or stained. By Ed McBain. It's not a mystery, it's a story of survival and triumph. But isn't it romantic! Before the show can open, the leading lady is really attacked, outside the theater. Book itself is very good. A beautiful First Edition copy of Ed McBain's KILLER'S CHOICE. Book dealer second. I'm always out bookscouting and adding to inventory. BOOKS ALWAYS BOXED AND I ALWAYS BUBBLE WRAP.